We at the New York State IPM Program work to ensure we are up on the latest information that is important to help you protect students and staff from pests. Here are some resources that have recently crossed our desk. IPM in any setting is not an one-person job. In schools, without help from staff and students, IPM is nearly impossible. P also stands for people! Janet Hurley Extension Program Specialist III – School IPM from Texas A&M AgriLife Extension Service discusses The Importance of Educating Staff about Your IPM Program. Stop School Pests has changed its name to the Pest Defense for Healthy Schools to emphasize its dedication to creating healthy, safe spaces for students and school staff by preventing pest problems such as mice, cockroaches, bed bugs, ants, and lice. The online professional training is targeted for specific school audiences including custodial staff, school nurses, grounds managers, school administrators, maintenance professionals, teachers, food services professionals, and pest management professionals. Cornell University turf specialist Frank Rossi talks about how to manage athletic fields to reduce injuries. This isn’t new, but it’s a must see for all school administrators, athletic, and grounds department staff. Safe sports field management will help to reduce the risk of injuries. 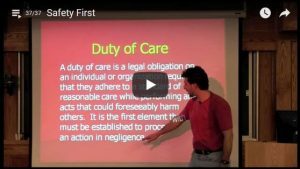 Frank Rossi, Cornell Turfgrass Extension Specialist, describes basic level of care of athletic fields in the video, Duty of Care. With the funding of the Don’t Get Ticked New York campaign, we have been pretty dedicated to (read: obsessed with) keeping up-to date on tick information. Here is some of the latest news. 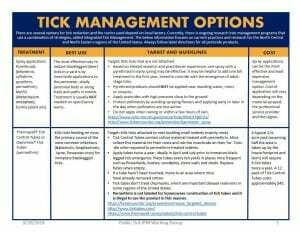 T he Public Tick IPM Working Group has created a document, Tick Management Options, showing some of the most effective control strategies. A number of these options would require an emergency exemption and application by a certified pesticide applicator. An Asian longhorned tick showed up in a sample of lone star ticks collected in Rockland County. The one with the short, stubby mouthparts is the longhorned tick. Need more information on school and childcare IPM? Visit our Schools and Daycare Centers page. This entry was posted in All Things IPM, Building IPM, School Grounds, schools, Sports Field Management, training and tagged athletic fields, Child Safe Playing Fields Act, Duty of Care, IPM, laws, Resources, school grounds, schools, ticks, turf on December 5, 2018 by Joellen Lampman. Recently members of the NYS IPM Program met in Albany as part of a joint meeting of the Clean, Green, and Healthy Schools Steering Committee and the Statewide School IPM Committee. NYS IPM Educator Joellen Lampman demonstrates ‘dragging for ticks’ as a method to determine tick presence on school grounds. Clean, Green, and Health Schools is coordinated by the NYS Department of Health and helmed by Dr. Michele Herdt. Their purpose is to promote a healthy learning and working environment in our state’s schools, both public and private. 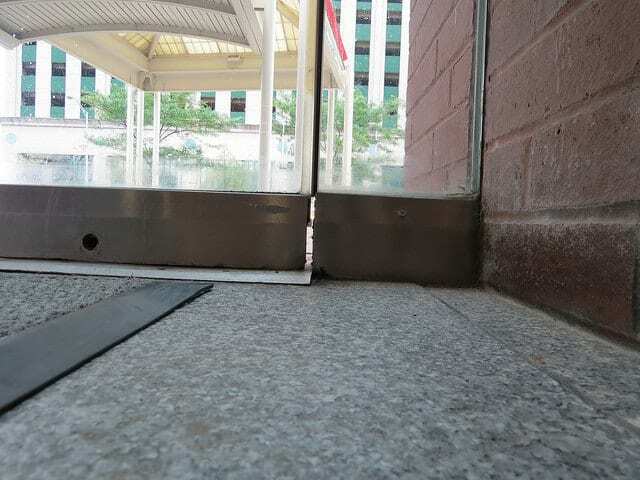 Unfortunately, gaps in outside doors are a common problem in public buildings and offers easy access to rodents. Last year, they began a free pilot program to create safer and healthier learning and working environments for all students and staff across New York State. We are looking for schools that would like to be a part of this pilot program and improve the environmental health of their school through low or no cost actions. As of October, 2018 they have ten school buildings involved, and hope to have at least 10% of NY schools enrolled in the program by 2024. The NYS IPM Program is glad to be part of the efforts. Later in the morning Vickie A. Smith and David Frank from the NYS Dept. Of Education shared their work with charter schools, engaging the participants in the joint meeting with ideas on how to better reach this growing segment of education in NYS. While we have sought to find a way to work with non-public schools in NY, charter schools are also another subset with their own particular concerns. Like many non-publics, some charter schools operate in rented buildings (some are indeed buildings owned by a public school), and therefore it is not always clear who is responsible for environmental issues school staff face. Charter schools have multiple authorities to report to depending on their location: The NYS Board of Regents, SUNY trustees, NY City Department of Education and the Buffalo City School District. Many students in charter schools are ‘at-risk’. 80% are considered economically challenged, or have disabilities or language barriers. Charter schools are considered public schools and must comply with many of the same rules. Our day of discussion proved there are plenty of opportunities to increase the use of IPM in all schools in NY State. 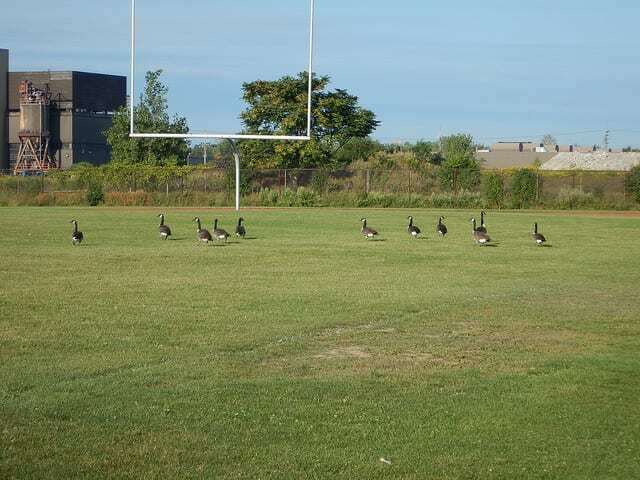 Geese on school grounds has become a growing pest problem as resident geese populations increase. Staff of the NYS IPM Program finished out the day’s meeting with a look at Don’t Get Ticked NY efforts. This included sharing the Ticks on School Grounds posters. For more on ticks visit our page Don’t Get Ticked New York. 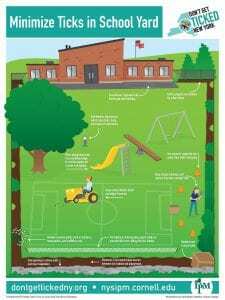 This entry was posted in All Things IPM, School Grounds, schools, Sports Field Management and tagged athletic fields, Healthy Schools, NYSIPM, school grounds, schools on November 8, 2018 by Debra E. Marvin. 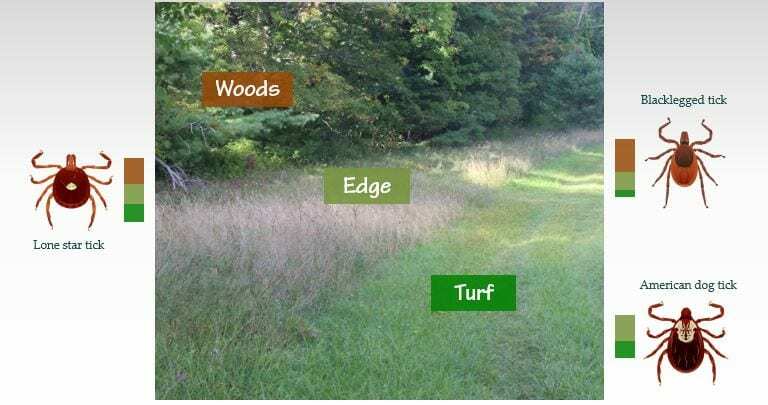 Tom Mathers, a personal tick education hero of mine, recently created #JustWrongEnough to cover those areas that people think they know, but puts them at risk. He used “ticks jump out of trees” and “ticks die in the winter” as examples. I have also heard many #JustWrongEnough tick beliefs that put people and kids at risk for tick-borne diseases. I won’t comment on people who believe they are safe because they have never had a tick on them. We won’t get into how much time a tick needs to be attached before transmitting disease-causing pathogens (I consider the 15 minutes needed from attachment to transmission of the Powassan virus to deem this argument moot anyway). And don’t get me started on the correct way to remove a tick. I covered this in my 2016 blog post, It’s tick season. Put away the matches., and have found no evidence to convince me that pointy tweezers are not the superior method. Let us focus, then, on #JustWrongEnough beliefs that are important to school and childcare grounds. #JustWrongEnough 1: All ticks carry Lyme disease. The risk: Individuals, and their doctors, might not know what diseases they might have been exposed to and lead to a misdiagnosis. Species matter! Different ticks carry different disease-causing pathogens. Tick-borne disease is very common in the Northeast. In addition to Lyme disease, ticks in the northeast transmit the pathogens that cause Anaplasmosis, Babesiosis, Ehrlichiosis, Powassan Virus, Rocky Mountain Spotted Fever, Tularemia and a bacteria related to the agent of Lyme disease called Borrelia miyamotoi. But different ticks carry different disease pathogens. In addition, not all life stages are equal. Most disease pathogens are ingested by the tick when they feed on an infected host. Adults are usually twice as likely to be carrying pathogens than a nymph because they have fed twice compared to the nymph’s single feeding. But we also know that Borrelia miyamotoi can be transmitted from an infected female to her eggs, so larval blacklegged ticks cannot be discounted as disease vectors. School nurses can play a crucial role in tick education. This was covered in our guest blog, The Role of School Nurses in Integrated Pest Management for Public Health. #JustWrongEnough 2: Ticks are found in tall grass. The risk: Individuals will only think about tick prevention and conducting a tick check when visiting areas with tall grass. Different tick species prefer different habitats, but that does not mean that you won’t find them in other areas as well. We can find ticks in tall grass, but we are less likely to find blacklegged ticks. And species matter! 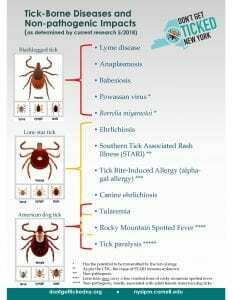 The three New York ticks that pose the highest risk to us are the blacklegged tick, American dog tick, and lone star tick. These three ticks prefer different habitat types. Blacklegged ticks prefer shady, moist areas. 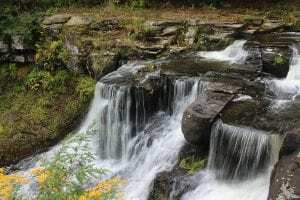 Dehydration is their greatest enemy, and so you are most likely to encounter them in the woods. But that doesn’t mean you won’t find them in a lawn or athletic field, especially in areas that receive significant shade. Ground covers, like pachysandra, found right next to buildings, can also provide suitable habitat for these ticks. On your school grounds, students will likely have little risk of tick exposure in the middle of the playing field, but it’s a different story when they chase a ball into the wood edge. 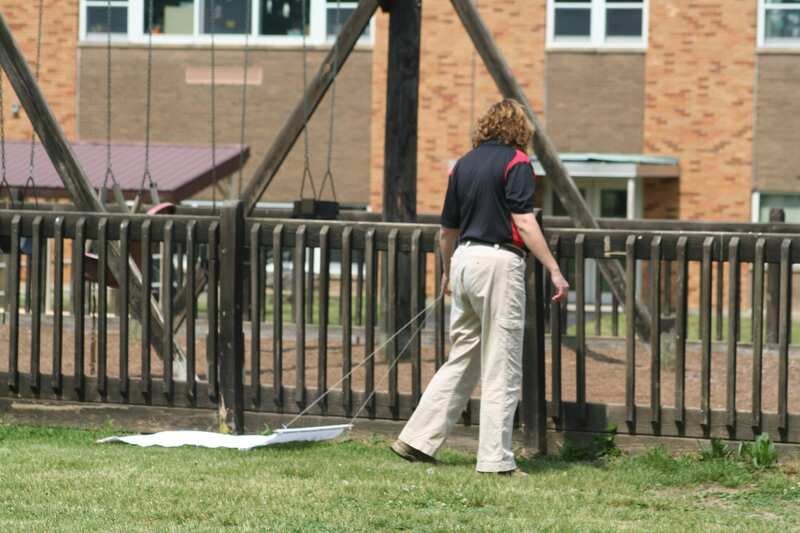 How can you determine if there are tick risky locations on your school or child care grounds? 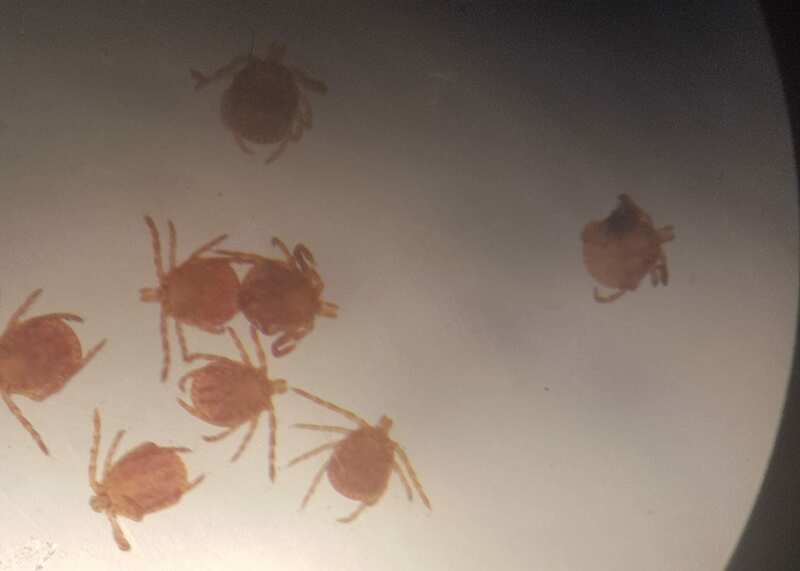 You can use a simple drag cloth to monitor for ticks, covered in the blog, Ticks: Assessing the risk at schools and child care centers. 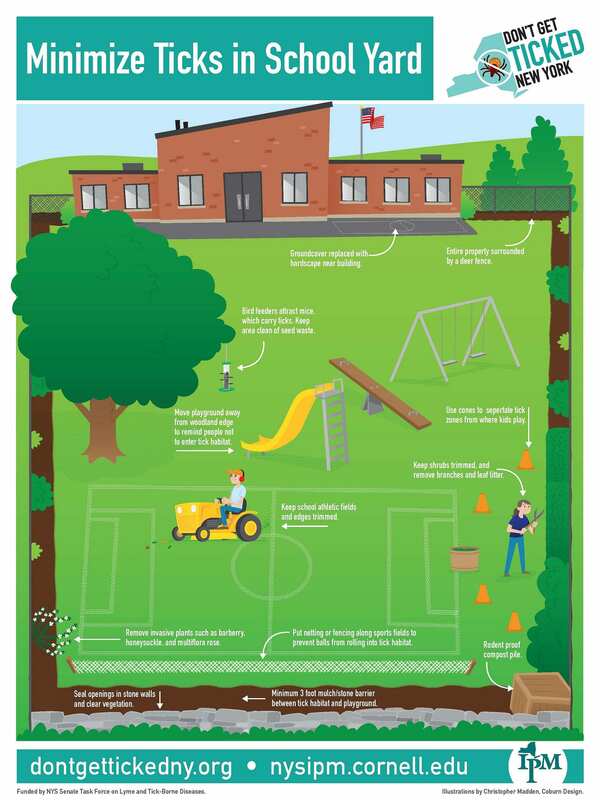 This is also covered in our infographic, Monitor for Ticks in Your School Yard. If you find locations with tick activity, you can take steps to restrict students from those areas by placing orange cones or signage. When access can’t be restricted, students and parents should be made aware of how to protect themselves from ticks. #JustWrongEnough 3: Ticks are a summer problem. The risk: Individuals will only think about tick prevention and conducting a tick check during hot weather. American dog ticks and lone star ticks don’t mind the hot weather and can be a summer problem. But just as different species of ticks prefer different habitats, they also have different seasons when they are most active. For the blacklegged tick, which is responsible for most of the tick-borne diseases in NY, the nymphs are most active in the spring and the adults most active in the fall. It is true that larvae hatch in the summer, and now that we know that they can transmit Borrelia miyamotoi we need to protect ourselves against them as well, but the greatest risk for disease transmission are in the spring and fall. The different life stages of blacklegged ticks are most active in different seasons, but ticks that did not find a host will continue looking when the weather is favorable. #JustWrongEnough 4: I can’t prevent ticks from getting on me. The risk: Individuals are so afraid of ticks that they avoid spending time outside. Here’s a gratuitous picture from a recent hike to highlight what you could be missing if you let a fear of ticks keep you inside. We often find we are walking a fine line between frightening people and encouraging them to take precautions. Our underlying message is you can go outside. There are proven methods that can be used to protect ourselves from tick bites and the pathogens that may be transmitted while the tick is feeding. Dressing the part, using repellents correctly, conducting daily tick checks, and knowing how to properly remove a tick can help you return from your next outing tick free. Details on these steps can be found on our How Do I Protect Myself From Ticks? page of our Don’t Get Ticked NY website. So let them play outside during recess. 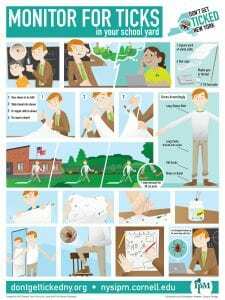 Take your students outdoors. And schedule that field trip. What questions do you have about ticks on school and child care grounds? You can reach me via email at jkz6 @ cornell.edu. This entry was posted in All Things IPM, BMPs, Camps, Child Care Centers, School Grounds, schools and tagged Healthy Schools, IPM, Lyme disease, monitor, monitoring, NYSIPM, risk, school grounds, schools, tick, tick-borne disease, ticks on October 22, 2018 by Joellen Lampman. Slime Mold – Pest or Not? When a problem presents itself, the first step should often be to determine whether it really is a problem. In other words, does it create a risk? At times, something may look scary, but may actually be eating other insects that are pests (house centipedes are a great example of this). Slime mold, a fungus-like organism, showing up in a school playground recently brought up the question of risk and how to react to it. Unsightly indeed. 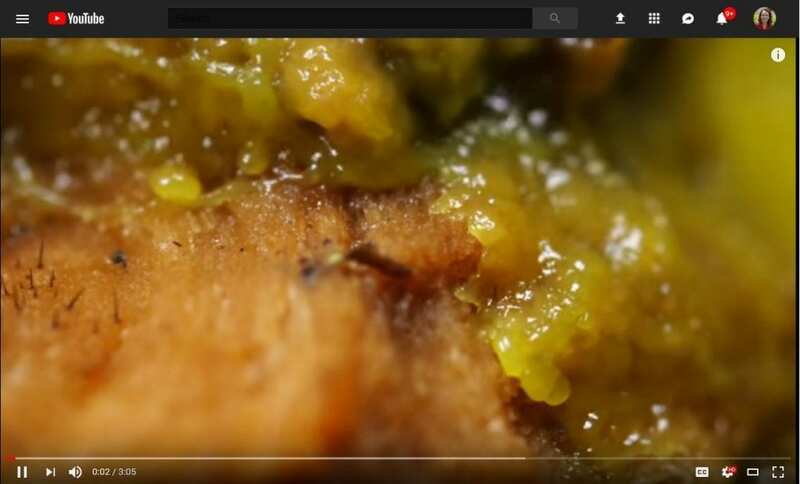 It is often called dog vomit mold. 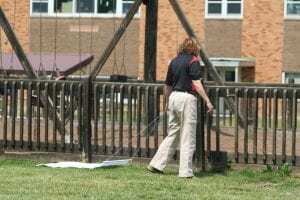 So a school was very concerned when it started popping up throughout the playground mulch. They began making phone calls which led to us. We were able to reassure them that slime mold feeds only on bacteria in the mulch and there are no known health risks associated with them. Slime mold crusts over after it finishes with its mobile stage. Still unattractive. 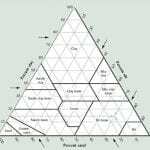 Human health risk usually reaches the highest tier of concern for risk assessment. Given the low risk, the school could just wait it out until the weather changes. 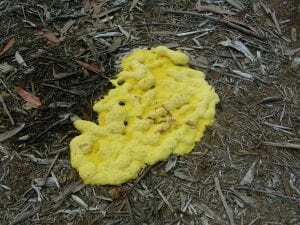 Slime mold thrives under hot and humid conditions. Cool, dry weather would take care of the issue. It’s a good reminder that many pests (or, in this case, non-pests) are weather related and checking the forecast can help us determine how long the issue might last. It’s worth noting that there are no pesticides registered in New York to manage slime mold on mulch. Any use of a pesticide would not only be illegal, but would also cause its own unnecessary risk. There is another concern that falls lower down on the list, but is still important – perception of risk. In this case, there was a concern about how parents of young children would react to the unsightly mounds. To address this concern, we recommended shoveling out the visible slime mold and hosing down the area to disperse residual materials. And reminded them that as long as the weather remained hot and humid, slime mold would continue to pop up, so keep the shovel at hand. A unrealistic perception of risk can also be addressed through education. So we found this nifty video about these fascinating organisms and how they move. Check out this Deep Look video from PBS. Talk about a teachable moment! Have a question on managing pests in your school or childcare facility? Visit our Schools and Daycare Centers webpage. 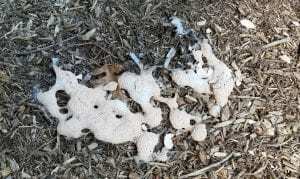 This entry was posted in All Things IPM, Camps, Child Care Centers, School Grounds, schools and tagged child care, communication, Healthy Schools, IPM, mulch, pesticide use, playground, risk, school grounds, schools, slime mold, weather on September 11, 2018 by Joellen Lampman. Are you interested in turfgrass management? Especially as it relates to sports fields? Then the ShortCUTT (Cornell University Turfgrass Times) newsletter, written by Associate Professor and Extension Turfgrass Specialist, Dr. Frank Rossi, is for you! Check out a segment of this week’s offerings. To receive a copy of the weekly newsletter, e-mail program manager, Carl Schimenti at css223@cornell.edu. Prefer your information verbally? Subscribe to the weekly Turf Talk podcast. My fields are showing wear stress already after three weeks of use as a result of rainy and now very warm conditions. I’m trying to speak with coaches and parents about field use under these conditions. They keep asking the same question of me, “how many hours of use CAN the field handle”? Can you help? First big kudos for recognizing the need to communicate with your clients regarding the conditions and safety of the fields. Effective communication is the consistent characteristic of successful professional sports turf managers. We have provided some useful tools to assist with the general information for players, parents, coaches and athletic directors at http://safesportsfields.cals.cornell.edu/coaches. Additionally, there will not be any hard fast answer to the question without some qualification and understanding of the root zone, type of use, maintenance inputs, and visual quality expectations. 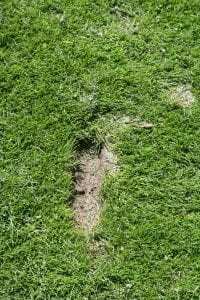 Our first responsibility is to ensure player safety as measured by field hardness, evenness and traction; other field issues become subjective as to what constitutes an “acceptable playing surface”. Again, there are gray areas when discussing amount of use, as poor weather experienced over the last 30 days has led to significantly more wear stress and field decline than expected under average weather patterns. Finally, larger amounts of managed field area that allows for dispersal of focused traffic and the availability of synthetic surfaces both significantly increase overall amount of natural grass playing field use. Soil properties impact traffic tolerance. Loamy soil root zones with some drainage and some irrigation can withstand more than the average amount of use. Sand-based fields with excellent drainage can withstand significantly more than the average amount of use. Any type of field use that results in repetitive focused traffic, i.e., between the hash marks, goal mouths, sidelines, will reduce the amount of field use. Larger male athletes create more traffic stress than lighter female athletes. Youth sports with smaller athletes and smaller field dimensions that can be rotated, allow for much more use than average. Again rotation allows for dispersal of the traffic. 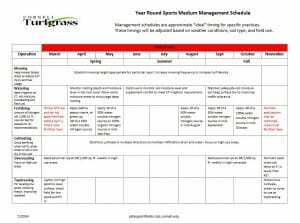 Reasonable care of fields is expected as outlined in ASTM F2060 for cool season natural grass fields – this will include some amount of field rest and recovery as outlined in these important maintenance schedules. In the simplest of terms, the more use a field receives, the more preparation it will need prior to the initiation of use, maintenance during the traffic period, and recovery maintenance following the traffic. No maintenance program will compensate for overuse that leads to decline in field quality below acceptable levels and will need a routine turf replacement program as seen in most professional sporting venues. Players, coaches, parents and Athletic Directors have the right expect to safe playing fields. Sports turf managers must have field safety measurements to effectively determine when field use leads to decline in safety. The visual quality of the field often is correlated to field safety but not always, as a soft bright green field with poor traction is less safe than a slightly brown firm even surface. In the end, general guidelines suggest good field conditions can be maintained with reasonable care at between 400-600 hours of use per year per field. Beyond 600 hours of use expect a loss in field quality and significant thinning and wear areas even under ideal conditions. Many thanks to Frank Rossi for providing permission to share this information. For more information on sports field management, visit the Cornell Turfgrass page on Sports Turf and the New York State Integrated Pest Management page on Landscapes, Parks, and Golf Courses. 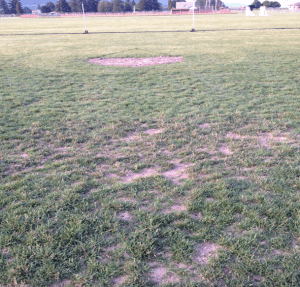 This entry was posted in School Grounds, schools, Sports Field Management and tagged athletic fields, Best Management Practices, communication, Duty of Care, Healthy Schools, IPM, school grounds, schools, turf on September 4, 2018 by Joellen Lampman.